Having a spa experience is a great way to relax and is a great respite from urban stress. And when this is in a beautiful setting, it adds more value to your spa experience. And this is exactly what I found at the Shine Spa in Sheraton Grand Bangalore. 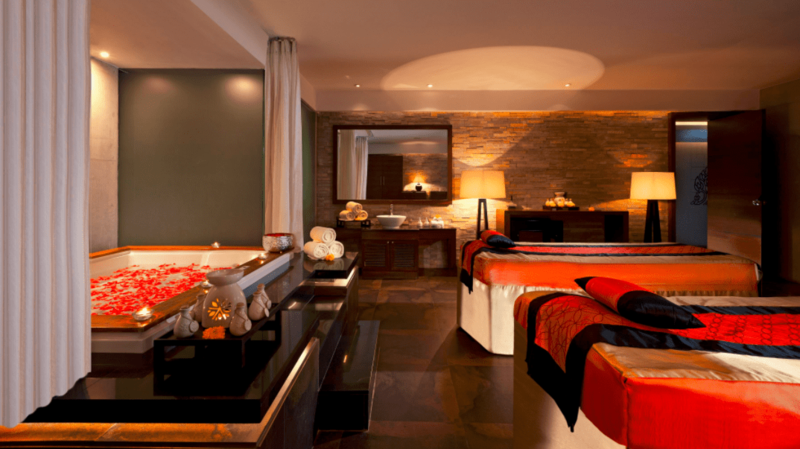 Shine Spa located on level four in Sheraton Grand in Bangalore is luxury personified. With interiors that are plush, the spa itself is large with a whopping ten rooms and a large menu of spa treatments done under trained therapists. The spa decor is elegant and classy with a contemporary, modern look. I am welcomed with a cold herb infused water – the welcome drink and led to a relaxation area that has comfortable sofas and tables, in beige and cream tones with magazines that you can read while you wait for the treatment to begin. The rooms themselves are spacious and are done up in hues of wood with a splash of red. The walls have innovative paintings that spice up the look of the room. With notes of soft music and a light aroma the rooms are great places to lull your mind into a state of rest. There are five couple rooms and five single treatment rooms that are done up in similar colour tones. I was advised to try the signature treatment the Shine massage by the spa manager Mahesh Lal. This was recommended as it aims to alleviate pain through the use of lavender aromatherapy oil. The essences are smoothed onto the skin using customized massage strokes leaving it glowing, nourished and hydrated. My therapist Ina from Nagaland led me to the treatment room accessible after climbing down a narrow winding stairway and a dimly lit corridor that sets the stage for a relaxed atmosphere. The room is large and has a Jacuzzi and bathroom attached as well. After changing, Ina asks me to sit for a foot soak when she does a quick wash of my feet and asks me to lie face down on the massage table. The massage is done with essential oil of Lavender known for its healing and restorative properties. My masseur starts the therapy by applying the oil liberally and then uses her hands deftly – apply pressure with the thumbs and palms as well as her entire hands to ensure that all the muscle tension is released. Her synchronised movements make me feel at ease and she is attentive asking me if the pressure suits me and if I am comfortable. The massage is available in 60 minute and 90 minute options and you can opt for what suits you. Ina also asks me if I would like oil on my face and hair and offers an option of a dry massage when I decline. In fact you can allow for the oil to soak into your skin if you do not have a shower immediately. Post the massage the herbal tea is exactly what the doctor ordered. I am advised to drink a lot of water during the course of the day as the massage with the water intake helps flush out toxins from the body. Post the treatment, I was asked to share a positive message that was hung on the glow board adjacent to the reception. The Shine Spa true to its name will leave you feeling shiny inside out – and that is a great deal you must give yourself. Timings: 9:00 a.m. to 10:00 p.m.
happy to know about the sap details of you where having the multiple of massages which help to reduce the stress.I have a good experaince at one of the Luxury spa in bangalore only for ladies.